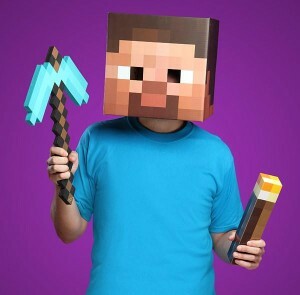 Minecraft Steve costume that you can use to dress up as a Minecraft character for costume parties and Halloween. The combination includes a foam pickaxe, functioning torch and Steve head. Officially licensed by Minecraft and definitely a quality product. The torch actually lights up using 3 AAA batteries to power it. Pickaxe made of tough foam that can take a surprisingly solid hit, even though it is not designed to be used that way. The Steve helmet has two little square pixelated holes you can see out of. All three of these items are really good and it is nice that they come in a combo now, which is very reasonably priced at under $70 for all of them. The pickaxe is very high quality and while it is foam it is quite a tough foam that can take more than you might expect. The torch actually functions and you can use it as a real torch if you want. The head is an exact likeness of Steve, which is the default appearance of the player in the game Minecraft before you begin customizing it. A very iconic and neat little set of items that will make your friends that play Minecraft very jealous. The head itself is the worst part of the costume but it is still quite nice. Basically it is just a box printed in the same way Steve looks from Minecraft with two added holes. It has still received positive reviews on Amazon and such, but individually it costs about $20 and simply is not worth that much. It has no real flaws about it and in this combination it is actually reasonable priced so not bad at all. A very nicely priced combination product that is perfect for costume parties and fans of Minecraft. Just give over your money already!